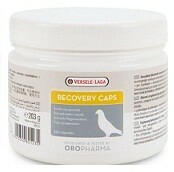 Promotes the muscle recovery and recovery of the normal intestinal and crop flora. Also make sure that the pigeons have the opportunity to drink as much water as they want after the administering. When administering, always first wet the capsule in a little water.